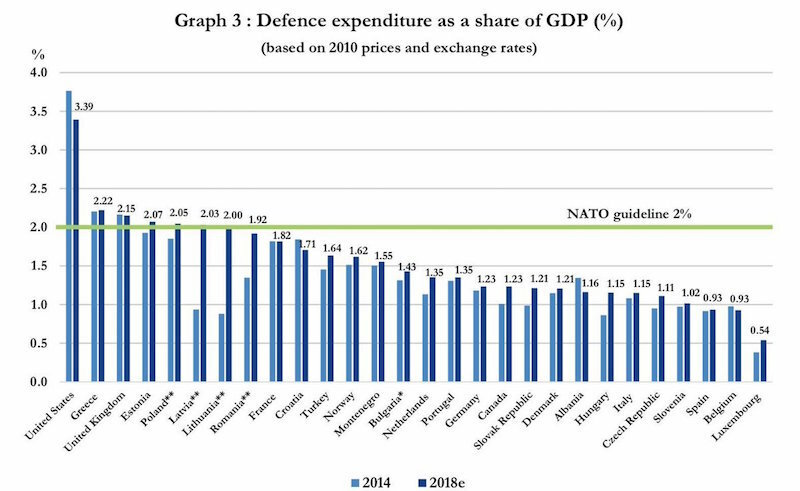 European NATO allies increased defense expenditure in 2018, with big rises in the Baltics, Poland and the Netherlands, according to new figures. But while Canadian spending fell, Germany's lagged and only six of NATOs 30 members, excluding the US, met the spending target demanded by President Donald Trump. Germany's spending actually rose last year but remained stable relative to growing gross domestic product (GDP). Berlin has previously attracted the brunt of Trump's claims of freeloading by European NATO members. With overall European spending up, hitting a five-year high of 1.51 percent of GDP, Britain, Estonia, Greece, Latvia, Lithuania and Poland met the 2 percent goal, according to the NATO 2018 annual report. Bulgaria, the Baltics and the Netherlands pumped in an extra 20 percent in 2018 compared to 2017. Europe in general has been pushed into more military funding following the 2014 Russian annexation of Ukraine's Crimea, Islamist militancy and Trump's demands for sharing the cost of defending Europe. Members have promised to try to hit the target by 2024 but slow progress has angered Trump, prompting him in August last year to threaten pulling out of the alliance if they didn't boost spending immediately. European states have argued security is not just about spending targets. Added to that, despite welcome growth rates, rising GDPs have made meeting the relative figure difficult. Europe's largest economy, Germany, invested an additional €1.5 billion ($1.7 billion) in defense last year, raising the figure to almost €42 billion ($47 billion) and keeping its rate as a percentage of GDP stable at 1.23 percent. That leaves Germany at the lower end of the spectrum, with the US at 3.39 percent, while Belgium and Spain remain below 1 percent of economic output. Spending in Canada fell by almost 11 percent last year. NATO head Jens Stoltenberg said the increase showed "we are moving in the right direction." 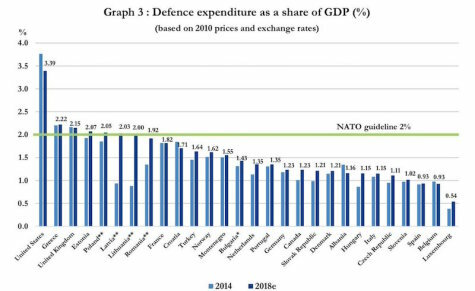 He had previously argued NATO is undergoing a significant shift in spending as it seeks to deter Russia and undergoes its biggest modernization in decades. From 2016 to 2020, NATO states excluding the US are expected to increase defense budgets by $100 billion. Click here for the full report (136 PDF pages) on the NATO website.